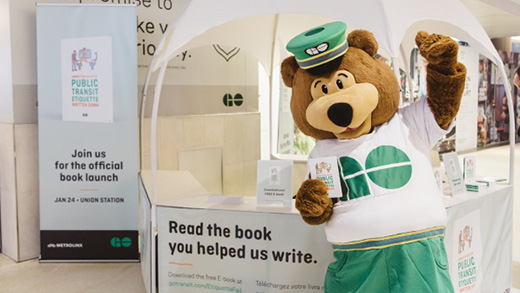 Believed to originally come from somewhere north of the Barrie GO line, the beloved mascot GO Bear has been a fixture at GO stations, stops, concerts, sporting and special events since 1993. You almost never know where he’ll turn up next, but whatever his next destination might be, you can bet he’ll always take GO Transit to get there. GO Bear loves nothing more than to meet and mingle with his fellow GO passengers. Whether meeting them on GO Transit, at a special event or his favorite place; Union Station before a Blue Jays game (GO Jays! ), GO Bear is always ready to remind people that GO Transit is the fastest and safest way to get around the Greater Toronto and Hamilton Areas. As exciting as the last 25 years have been for GO Bear, he’s pumped for what the future holds. With new and expanded GO services, stations, a renewed focus on Safety and lots of new passengers to meet and greet, GO Bear will be busy and on the move for the foreseeable future. To keep up with GO Bear and find out where he might pop up next, Follow Us on Twitter, Facebook, Instagram and YouTube. He’s never ever late for an appointment. Is a true Blue Jays fan. Believed to live in a modern Den somewhere in Union Station. Loves showing up at special events all over the Greater Toronto and Hamilton Areas. Knows every GO schedule and Route. Loves peanut butter but, dislikes any kind of jam! Keeps track of every GO Transit employee’s birthday. Knows more about GO Safety than almost anyone. Is not related to Carleton Bear but thinks the Leafs are cool.